Tuscany and Rome make a picture-perfect holiday destination, with beautiful rolling countryside, charming hill top towns, and delightful cities. Here’s our pick of 5 great days out in Tuscany and Rome. The regional capital of Tuscany is Florence, one of Italy’s prettiest cities and an art lovers Mecca. The city is packed with beautiful historic treasures, and the brightly coloured cathedral dominates the skyline. It was in Florence that Michelangelo, Leonardo da Vinci and other brilliant 14th to 16th Century Tuscan artists carved out history, and today art is waiting to be discovered on each and every corner. Visit the Galleria dell’Accademia, home to ‘David’ the artistic masterpiece by Michelangelo. The museum also houses an interesting collection of paintings from the early 17th Century. White sandy beaches may not be the first thing that springs to mind when you think of Tuscany. The region is usually associated with art and culture, or cookery schools and delicious Italian cuisine. 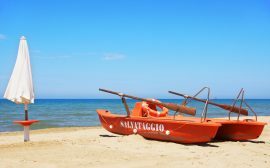 But as well as being a fantastic base for cultural and country pursuits, Tuscany also shares 250 miles of beautiful coastline with the Tyrrhenian sea making it a great base for an all-round enjoyable holiday. Rome still contains many remnants of its past glory, and between its architectural heirlooms is a bustling, lively and modern city. Take time to wander round and soak up the spirit of this city; enjoy fresh pasta from one of the bustling cafes, dodge vespas on the chaotic streets or stop to hear stories from an elderly couple ambling down the street. Obvious highlights of a visit to Rome include the Pantheon, the Colosseum, the Trevi Fountain and the Spanish Steps. The Vatican City is an independent state within Rome which has its own currency, postal service and army – this unique city within a city is well worth a visit too. The final in our series of customer profiles is a rather special one. Peggy Boyd and her family travelled on their first Canvas Holiday in 1967, making them some of our first ever customers. Here’s Peggy’s story – we’re really looking forward to meeting the Boyd family at our anniversary ball this weekend. Today, we introduce you to Mummy Barrow. She writes a rather wonderful blog over at www.mummybarrow.com and can be found tweeting @MummyBarrow. We’re delighted to be working with her for our 50th celebrations. Here’s her Canvas story. Ooohhh is this thing on? Hello. Hi. My name is T (short for Tanya which I really don’t like, and I hate Tan even more so please do call me T. Ironic really since my parents named me Tanya as it can’t be shortened) What? Get back on track? Sorry. Sorry. Yes. Hello. I am slightly bonkers mum of three who lives in Hampshire with the long suffering Bruce.